While steady, heavy rain has departed, clouds and nuisance drizzle are expected to round out the week. Sunshine will gradually return through the weekend. Today and Tonight: The low pressure system associated with Thursday’s rain will linger over the area on Friday. While some pockets of clearing may look promising, a stubborn cloud deck and isolated, light showers or drizzle should persist for the bulk of the day. Due to this, it will be chilly with highs struggling to get out of the mid 50s. Overnight, continued clouds will stop lows from escaping the low to mid 40s. 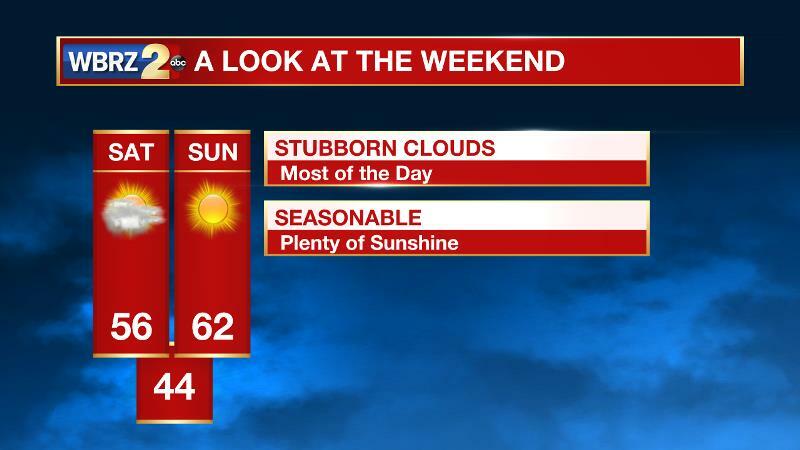 Up Next: Clouds may actually hang on until Saturday afternoon but mainly clear skies are expected for the second half of the weekend into early next week. 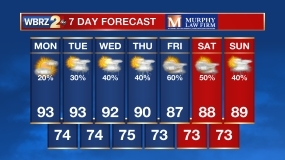 Temperatures will be within just a few degrees of seasonal averages—that is, highs near 64 and lows near 43. The next shot at showers will come during the middle of next week, but confidence in that event is low at this time. Wondering about the weather for Christmas? Our team has the long range outlook! CLICK HERE for the story. Common with a mature to decaying storm system, a dry slot will move across the region allowing for a temporary period of clearing before the axis of the upper level low brings moves clouds and spotty drizzle. This trough axis will clear the region on Saturday evening, taking the clouds with it. There could be some sunshine prior to sunset, but not much earlier. Cloud cover will create a smaller diurnal range in temperatures with highs in the mid 50s Friday and Saturday with lows in the mid 40s. As skies clear, the following few nights will be closer to 40 with afternoon sunshine bringing highs near 60. A weak upper level ridge will quickly traverse the area Sunday through Tuesday maintaining quiet weather. Forecast models are struggling to find common ground on the next storm system. Both indicate another shortwave trough in the southern branch of the jet stream however; the location differs from southern Oklahoma to south Texas. The track will have a significant impact on whether or not that system will bring rain to the region. At this time, as two of the three global models take the farther northern track, a chance of showers will be included in the forecast for Wednesday and Thursday.